For my faceOSC project I created a bubble wand that you control using your face. The center of the wand is mapped to the center of your face so it fill follow the path your face moves in. To blow a bubble you move your mouth the same way you would to blow a bubble using a physical bubble wand. The longer you blow, the bigger the bubble will get. When you relax your mouth, the bubble is released from the wand and will float freely. There are three wands each with a different shape (circle, flower, and star). You can switch between the wands by raising your eye brows. Below is a video demonstrating and explaining my project. You can download the source code here. Bubbles from Erica Lazrus on Vimeo. The original idea of this project is using FaceOSC to capture emotions to control your web experience. 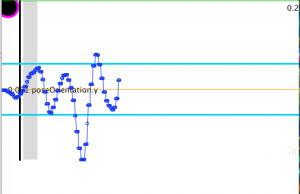 It combines ofxOSC and ofxJSON addons together to change the way how you tweet. In the video, if you keep your mouth open enough, you will see the current top 10 trend from Twitter. Tweet met some problems right now with OAuth. I am working on this. 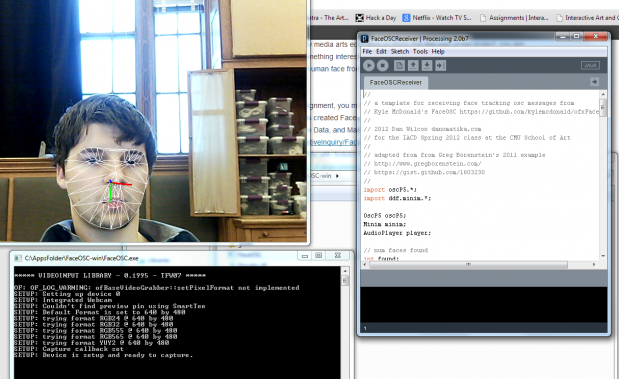 My FaceOSC project uses Open Sound Control to transmit the parameters of my face via the internet to my Processing sketch. My sketch uses the eyebrow and mouth data to determine the size of the alpha mask over an image of Spongebob Squarepants. Only when I am closest to the camera and my face is ridiculously wide open can I see the image in its entirety, at which point Spongebob’s laughter is triggered. Is he laughing at you, or with you? 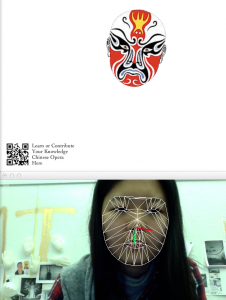 This is an interesting interface enable you to change your face like a Sichuan Opera Pro. You can also learn more about the story plot and history behind that face. – just use your cell phone scan the QR code below. This entry was posted in face-osc, project-1 on 28 Jan 2013 by Meng. Hamburger eating contest using FaceOsc and Processing. 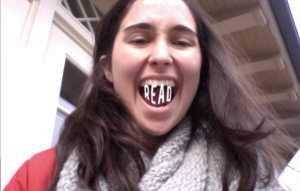 It tracks the user’s mouth height until it reaches a threshold. You’ll take a bite out of the hamburger when you close your mouth again. The image sequence is stored in an array and is called according to the counter. Future work would be to implement head position and show the bite with the corresponding location on the hamburger through image masking. 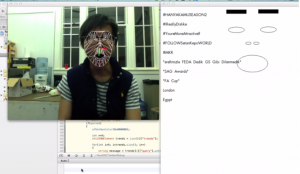 FaceOSC+Processing from kaikai on Vimeo. This is my faceOSC+Processing experiment. For my faceOSC implementation i utilized Processing and Dan Wilcox’ Face class. 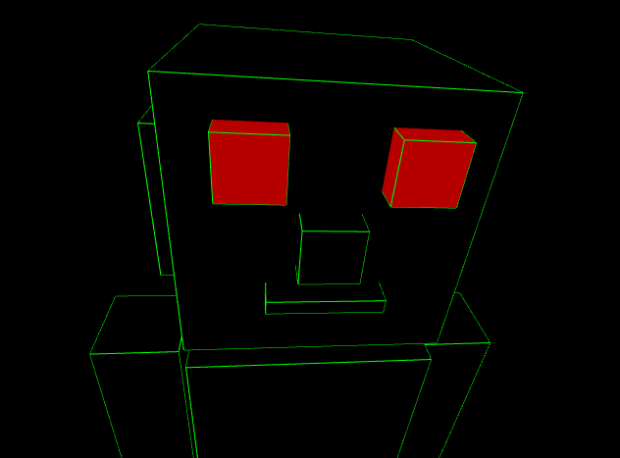 My sketch is a 3D Robot who can be controlled by facial rotation along the x,y, and z axis and by scaling along the z-axis. The robots eyes are semi-independently articulated by the eyeBrow properties of the face object. Additionally, the robot’s eyes glow red when the user opens their mouth fully. See the video below for a working demo. fosc from john gruen on Vimeo.